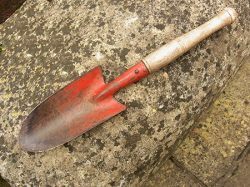 English vintage Planting Trowel. Steel head with pitted patina and traces red paint. Mid length ash handle. 15 inches (38cms).